3 heaped tablespoons provide 1 of your 5 a day. Brilliant in soups, curries & bakes. Fat-free. High in protein. Source of copper and iron. Suitable for vegetarians. 1. Rinse thoroughly before cooking.2. 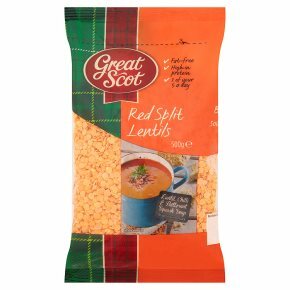 Place 100g of lentils into a large saucepan with 500ml of water.3. Boil for 10 minutes, then simmer for 15 minutes, until the lentils have softened but are slightly firm to the bite.4. Drain, rinse and use.